Two ancient platforms are located in the north of Eurasia (Figure 1.1): the East European and the Siberian. They belong to the northern, so-called, Laurasian group of platforms (Koronovsky, 1984; Ocherki, 1992; Khain and Koronovsky, 1995). Both have a Precambrian basement and late Precambrian-Riphean-Wendian and Phanerozoic cover (geological epochs are listed in Table 1.1). 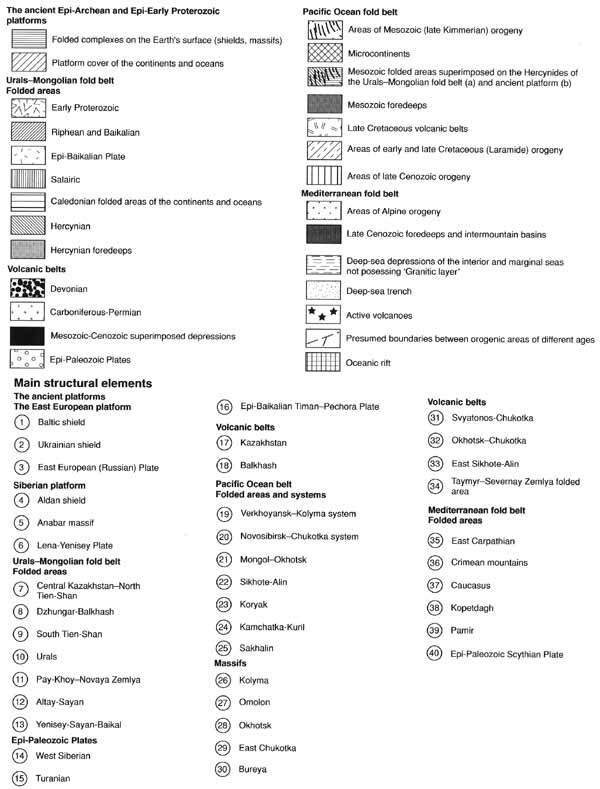 The platform boundaries are for the most part clearly traced, although locally they are ambiguous and are characterized by rectilinear segments, different angles of which reflect their fault character. Between the platforms and along their edges, cover-fold belts of various ages are distinguished. These are the result of the long-term evolution of ocean basins, island arcs, marginal seas, and microcontinents of the geological past, for which the Precambrian platforms and smaller microcontinents serve as an original rigid frame. The Urals-Okhotsk belt is the largest of the belts and is a wide arc with a convex southwards configuration. 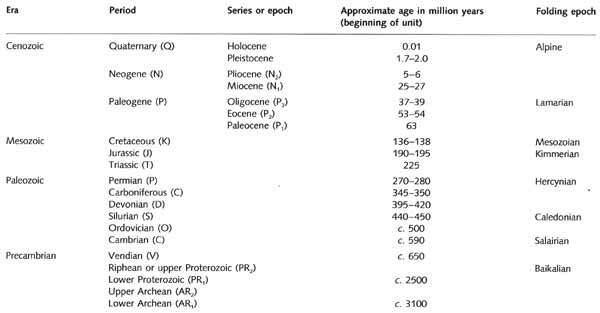 It was formed in the early Riphean and in its development the stages of Baikalian, Salairian, and Hercynian foldings are well defined (orogenetic and magmagenetic epochs are listed in Table 1.1). These became welded into a single whole with the surrounding ancient platforms in the late Paleozoic. Within the belt some regions are distinguished, in which fold complexes of various ages are brought to the surface. Locally, they are transformed into mountain structures and are overlapped by a horizontal cover of Mesozoic and Cenozoic sediments (i.e., the young Epi-Paleozoic plates, as a result of late Cenozoic tectonic movements). Accordingly, within the belt fold areas and plates are distinguished. From the south and south-west, the Siberian platform is composed of the Riphean Yenisey-Sayan-Baikal area (in a wide sense) and the Baikalian fold zones, which as a rule formed in the late Cambrian (before the Vendian). Westwards, the vast Paleozoic Altay-Sayan area is located, within which certain fold systems are distinguished: Salairian Kuznetsk-Eastern Sayan; Caledonian Western Sayan, and Altay; Hercynian Salair-Anuy-Chuya, Tom-Kolyvan, Ore Altay, and Zaisan. Within the central part of the Urals-Okhotsk belt the Paleozoic fold area of Central Kazakhstan and North Tien-Shan is located, including the Caledonian systems of Central Kazakhstan and North Tien-Shan; Chinghiz-Tarbagatay and Dzhungar-Balkhash Hercynian, and the Caledonian-Hercynian system of the middle Tien-Shan. The Hercynian South Tien-Shan fold area, consisting of a number of systems, is located in the south. Within the extreme west of the belt, bounding the East European platform, the Paleozoic Urals-Novaya Zemlya fold area is located, consisting of the Hercynian system of the Urals and Pay-Khoy-Novaya Zemlya Hercynian-early Kimmerian system, related to the Arctic belt. From the west the system is bounded by the extensive Cis-Urals edge basin. In the north-west of the Urals-Okhotsk belt it comprises the Epi-Baikalian Timan-Pechora Plate. The major part of the belt is overlapped by a thick cover of Mesozoic and Cenozoic sediments, filling, by and large, the Epi-Paleozoic West Siberian Plate, within the central and northern parts of which the vast pre-Baikalian and Baikalian massif is located. In the south-west, part of the fold structures of the belt are overlapped by a cover of Mesozoic and Cenozoic sediments and also those from the Epi-Paleozoic Turanian Plate, the southern segment of which is a constituent element of the Mediterranean belt. Eastward, the Urals-Mongolian belt spread to the modern shores of the Sea of Okhotsk during the Hercynian. However, during the Mesozoic the eastern part of this belt was under the strong impact of the Pacific belt and actually joined it (Mongol-Okhotsk area). The eastern half of FSU territory is part of the Pacific fold belt. In its western part the Verkhoyansk-Kolyma Mesozoic (late Kimmerian) fold area with the Omolon massif and the edge of the Cis-Verkhoyansk basin are distinguished. From the east this fold area is bounded by the Okhotsk-Chukotka late Cretaceous volcanic belt. From the main 'trunk' of the Pacific belt, deep in the interior of Asia, Mongol-Okhotsk, the late Kimmerian fold area stretches as a protuberance, while eastwards the Sikhote-Alin Mesozoic (late Kimmerian) area is located. It is bounded from the east by the Sikhote-Alin late Cretaceous volcanic belt. Between the Mongol-Okhotsk and Sikhote-Alin areas, the Epi-Baikalian Bureya massif is located. It is the peripheral northern part of the East Chinese platform. East of the late Mesozoic volcanic belts are found more interior fold areas of the Pacific belt, which closed in the middle of Cretaceous or at the end of late Cretaceous (Laramian folding). The Koryak fold area of the late Mesozoic is found, within which from the west to the east a number of systems can be found. It closed during a later period and has a westward thrust. Southwards, the Kamchatka Cenozoic fold area and the late Cenozoic Kuril area are distinguished, and in the extreme south is the Sakhalin Cenozoic fold area. The extreme eastern part of the Pacific, comprising the Komandorsk-Aleutian island arc, and the eastern shore of Kamchatka and the Kuril island arc, have great tectonic mobility, volcanism, and a sharply differentiated relief. They belong to the modern active continental peripheries, within which occurs the subduction of the ocean crust beneath the continental crust. Within the northern part of FSU territory, in the littoral zone and the islands of the Arctic Ocean, the fragments of another, as yet poorly investigated Arctic fold belt are located. The Taymyr-Severnaya Zemlya Paleozoic-Kimmerian fold area belongs to this zone, which comprises the Severnaya Zemlya Caledonian system, Kara Epi-Baikalian massif and South Taymyr Kimmerian system, essentially epi-platform, as well as the Novosibirsk-Chukotka late Kimmerian system. The southern part of the territory of the FSU is occupied by the outer zones of the sublatitudinal Mediterranean belt. This comprises the northern Hercynian part, which during the Mesozoic and Cenozoic, developed into the Epi-Paleozoic Skythian Plate and the southern part of the Turanian Plate, where the Baikalian massifs play an important part. Southwards, the Alpine fold areas of the Crimea, Caucasus, Kopetdagh, and Pamir are located. Within the latter, the Alpine stage of development is reduced, and folding occurred at the end of the late Cretaceous. During the Neogene period it was resumed, together with cover formation. Within the Lesser Caucasus the most interior zones of the Alpine belt are characterized by ophiolites which mark a basin with a crust of ocean-type Tethys. The deep-sea troughs of the Black Sea and southern Caspian belong to the same belt. With regard to the tectonic regionalization of Northern Eurasia and distinguishing within its boundaries a mosaic of ancient platforms and fold belts of various ages, one should be aware of the fact that the majority of the latter features occurred as a result of ancient ocean basins closing, as well as the subduction of the ocean lithosphere and the formation of island arcs and marginal seas (Zonenshain et al., 1990a, b). 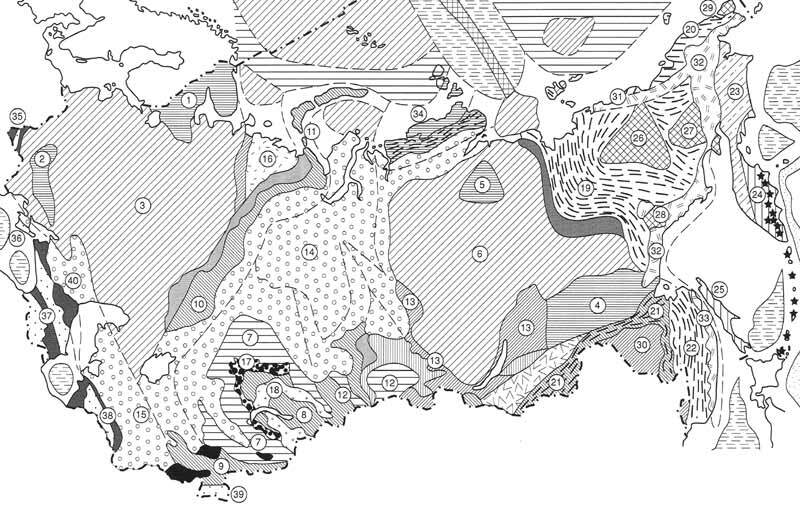 As well as the two major continental blocks of the East European and Siberian platforms a number of smaller continental massifs exist, which participated in the accretion processes of the continental crust and comprise, along with them, an intricate complex. This is the Hyperborean ((from Greek hyperboreios) means 'located in the far north') massif in the north-east of the Arctic seas shelf and the Barents Sea; Khanty-Mansian massif overlapped by the platform cover of the West Siberian Plate; Kazakhstan-North Tien-Shan, Atasu mountains and Ustyurt, Karakum, Tuva-Mongolian, Khinghan-Bureya, Khanka, and, in the extreme north-east, Omolon massifs. The most important role in the history of the fold belts of Northern Eurasia was played by two paleo-oceans, Central Asian and Tethys, and the interaction of associated plates formed the Eurasian continent. The modern boundaries of the lithospheric plates are fixed by zones of increased seismicity, located mainly along the southern and eastern margins of the FSU territory (Zonenshain et al, 1990a, b). The reconstruction of geological development in the past allows differentiation of the deposits of the island arcs of the marginal seas, continental slope, and passive continental margins within the fold belts. The ophiolite association, marking the basins with the ocean-type crust, predominantly in marginal seas or in the basement of island arcs, is of great importance. The ancient continental marginal volcanic belts, similar to the Cretaceous Okhotsk-Chukotka, indicate the position of ancient, subduction, and seismofocal zones (Khain and Bozhko, 1988; Khain and Seslavinsky, 1991; Khain and Balukhovsky, 1993).